If present, and if set to true, this score will be used as a default PSM-level filter when viewing data. Use sparingly. This is the default cutoff value for this score when filtering data. If default_filter is set to true, this value must be set. 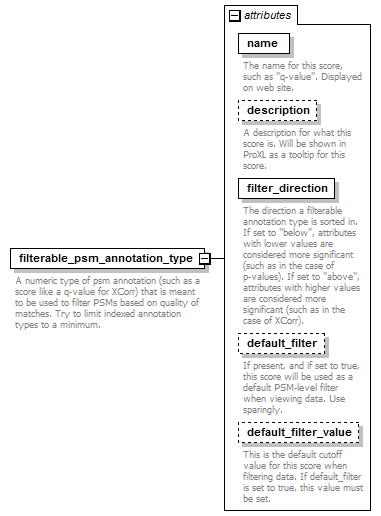 A numeric type of psm annotation (such as a score like a q-value for XCorr) that is meant to be used to filter PSMs based on quality of matches. Try to limit indexed annotation types to a minimum.